I love creams and lotions, and now that I’ve started making my own (my first love being the Dry Skin Relief Cream), I’m having a blast experimenting with different ingredients. This recipe is a variation on my dry skin relief cream – and I think the addition of beeswax pellets helps it to lock in the moisture even more. I poured my melted concoction directly into glass jars to make it easier. If you want more of a soft whipped consistency – go ahead and let yours harden in the fridge a bit, then whip it a bit before putting into containers. This luxurious moisturizing cream goes a long way - perfect for dry winters! On low heat, melt the ingredients together, stirring occasionally. When the ingredients have liquified, remove from heat and add essential oils. Pour into jars and let harden. OR let harden and then whip for a softer consistency. And since I made some fun labels to go on my jars as gifts – I have included the FREE PRINTABLE for you too! I used Avery 8160 labels for these 2 oz jars from SKS Bottle & Packaging, which are the perfect size for giving as gifts or throwing on your nighstand. 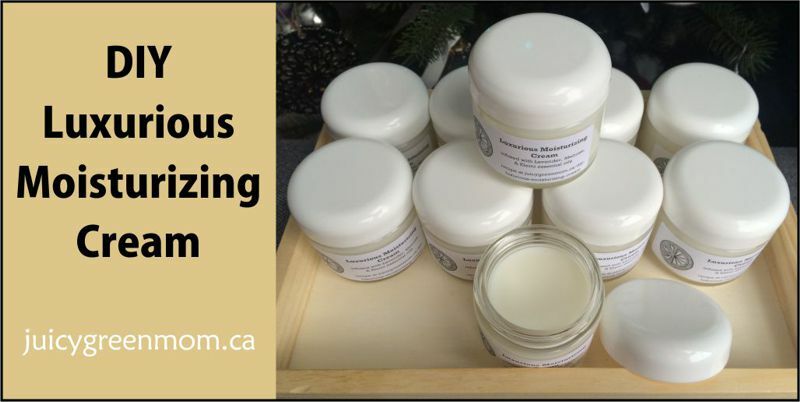 What’s your favourite DIY moisturizing cream recipe?